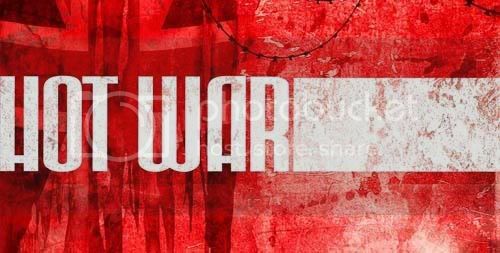 The Hot War Intro told us that this is a game of horror and survival that takes place in the city of London, England in the freezing winter of 1963. In addition to the basic introduction we featured two dark images from the new book. The second preview featured information on the Special Situations Group. The SSG is tasked with hunting down monsters, madmen and other enemies. Known to have infiltrated London early in the war, the Bayonet Troops became so named for the vicious matter in which they stabbed their victims to death. Their appearance, at a distance, seems normal. Up close, they seem to have too many joints in their arms and legs, their rough uniforms bunching and sagging in all the wrong places. Their faces are shrouded by what look like combined gas-masks and helmets that contain a greenish, pressurized vapour. The Bayonet Troopers are known to always operate in squads or packs and seemingly prefer to carry out their business during the hours of darkness. Several have been captured alive, but they soon die once their helmets have been removed. With strangely child-like faces and tiny, gasping mouths, they present a disturbing sight. Scientists have concluded that the Bayonet Troops are, essentially, a disposable assault weapon. They seem unable to feed themselves, simply hunting and killing until they die of starvation. This raises an vital question that is perplexing the Government and military: if they live such short lives, why are they still being encountered? The Creeps are an enigma. Dressed in Soviet uniforms and gabbling in broken Russian, they seem to have no allegiance to their supposed masters, attacking anything and everything with maniacal intensity. They look, at first glance, to be fairly human. Their skin is pasty and dry, with the appearance of a disease such as psoriasis or eczema. Every Creep that has been subject to autopsy has electrodes that run from the base of the neck into the brain. Connected to this is a long, antennae like wire which runs down the right hand side of the body, under the skin. What purpose this serves has not been discerned. Creeps still appear in large numbers, so it is supposed that they are appearing from somewhere. Strangely, there have also been encounters with monsters that bear a very strong similarity to the Creeps, only clad in British-issue clothing. Horrible, flowing, wavering black masses that crush and pulverise everything in their path, the so-called Servitors are painful to look at terribly hard to destroy. And, even more than that, no one has yet been able to figure out what the Servitors actually are or even what they are constituted from. It is fairly certain that the Servitors do not come from our world, that they have been brought here from somewhere else. Rumours are rife that British scientists also knew about these being and were attempting to develop them as weapons of war. Nobody in the scientific establishment is saying anything. A nuclear weapon that exploded on the South Coast is said to have been set off purposely to destroy a massive servitor wave heading for London, but solid information on this is scarce. The creatures (if they are indeed alive) can still be encountered in the countryside, moving at random (or so people think) across the land. They have also been sighted in the London Underground, flowing through the tunnels, pushing waves of squealing, terrified rats before them.